There isn’t doubt that every iPhone variant looks sleek and premium, but the sharp edges hide the truth that makes it quite a bad experience for every Apple device owner. From uncompressed photos to unused files, Useless app caches and backup logs, your device stores everything. Probably, you would find that lost cookie from the last Christmas as well But how is this related to us? Well, how many you face the problems of getting a less storage error when you need to update the iOS version or just download a new app from the Store. Bulky and Slow performance even after deleting some of your good pictures and videos due to lack of storage expansion. Well, the problem has been running in the iPhone Generations and Apple’s storage management restriction don’t provide us with the feature to a control of what’s going to store on our devices. Fortunately, you won’t have to spend rest of your days on your laptop, taking backups using iTunes and getting some free space on your iPhone. Software that would do the job for you. So, without any further chit-chat, let’s start the review of iMyfone's Umate Pro, a Space Cleaner for iPhones. iMyfone Umate Pro, an iPhone cleaner that is dedicated to removing all the junk you’re your device. It packs some useful and reliable features that'll help you to clean up to 30+ unwanted files, junk files, and much more. The program literally refreshes up your iPhone with reclaiming more than three fourth of the photo storage on your device using its lossless compression storage. It is an excellent and time-saving program for users especially for a 16 GB owner who craves for even KBs of data. Here’s a catch, you don’t need to buy a newer iPhone with upgraded storage to lead a better life. Just invest a little in the Umate Pro version, and you’ll surely become much happier. The program is available for both Windows & Mac OS devices. 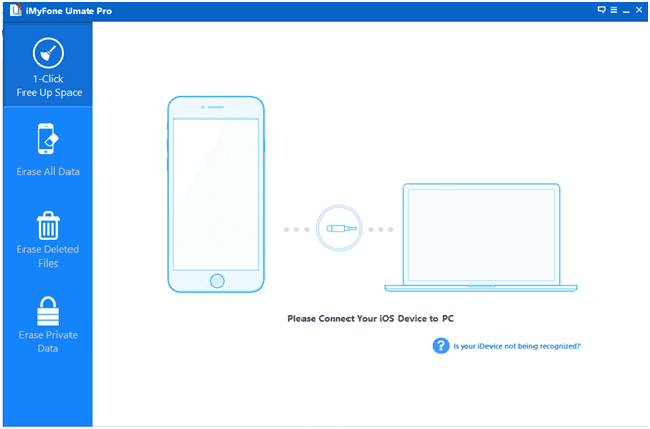 It doesn’t ask much for the configurations and supports the latest iOS 10 and the iPhone 7 seamlessly.Of course, there’s a trial version for the Umate that you can download absolutely free from the iMyfone website or the links mentioned below. After few clicks, here and there, the setup would be complete and you’ll be all set to make your iPhone faster. Assuming that you already own the iTunes software on your device, you can start the Umate Pro app. If not, then download it first. The program is very easy to use, and the interface is straightforward. Umate Pro provided four different methods to clean up space from your iPhone. The 1-click clean-up is the simplest and most recommended way as it could be used by the noobs as well. Apart from this, there’s an advanced all data Eraser which sets back the device to its Factory State and deletes almost every data possible on your iPhone. Also, Private File Eraser & Permanent file delete feature destroys all your personal data on the device. Non-Recoverable & fully secured. The smart algorithm of the software combines over 25 methods and techniques to analyze and target the particular junk files. It then eliminates all the temporary files, and that unwanted junk is making the storage free and ultimately your iPhone faster. You can also select and remove all the unwanted files and apps on your device too. No need to worry as the software keeps a compressed backup of all the deleted files that you can restore later if needed. In this way, there would be no data loss and you can manage the space on your iPhone. Hosting so many incredible features, how much does this software cost? Well, the iMyfone Pro is priced at a discounted price of $29.95 instead of $49.95 for both Windows & Mac variants, license for one PC only. However, you can get a fantastic deal on the pricing with an exclusive 60% OFF discount on the original price. 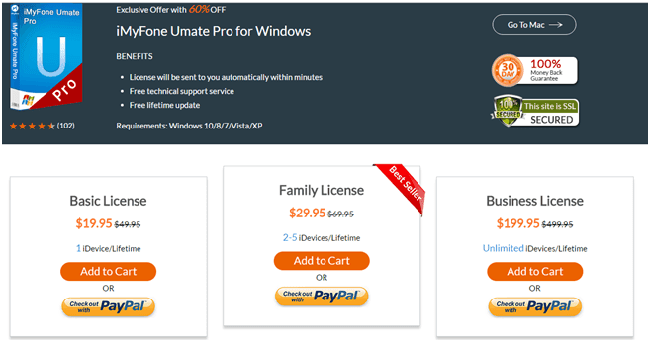 Therefore, you purchase the Umate Pro, single licensed for as low as $19.95. Just click on the links mentioned below and avail yours now. So, this was my review of the Umate Pro and how you can use it get tons of free space on your iPhone without any data loss. Overall, this software is the best and the most recommended in the market and offer a lot more than its price range. Do comment below if you’ve used this tool to clean up your iPhone and be sure to ask any query related to this tool. Cheers!